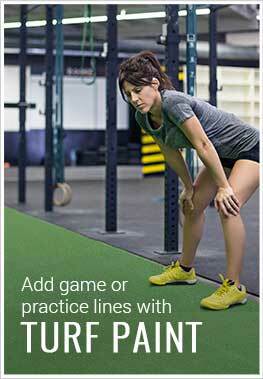 Description - Our Adrenaline turf rolls are great for any indoor application. These easy to install turf rolls are available with or without cushion and are great for doggy daycares, Cross Fit exercises and much more. These rolls are backed by a 5 year warranty and provide you with the look and feel of real grass. Material – Nylon fiber with a unitary of foam urethane backing. Note: Nylon is a coarser fiber and may be abrasive when doing floor exercises. We recommend using a mat over the turf when doing these types of exercises. Thickness – ~1/2" with unitary urethane backing and .837" with urethane foam backing. Recommended Uses – Adrenaline turf rolls are great for any indoor residential or commercial space. These rolls have been used a flooring for indoor putting greens, indoor patios, as doggy day care flooring, in commercial gyms, and much more. I'm really pleased with the turf roll! I wasn't sure quite how this would work out but have to say my expectations were exceeded!